This beautiful holiday home is built according the age old Norman tradition: using wood beams and stones. The home has a nice terrace, an ideal spot to enjoy the outdoors. Go for a walk in the large garden full of flowers. You'll share the garden with the owners. All the ingredients to relax are present here. You'll be able to use a barbeque: perfect to end the day on a culinary note! The home has a cozy interior and is furnished with all conveniences so that you'll feel right at home in no time. The only occasional noise that you'll hear in the serene environment is the whistling of the birds. 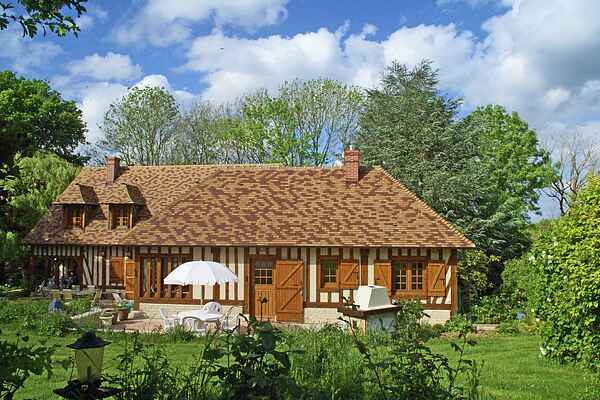 Your grocery shopping is easily done in the lovely village of Dampsmesnil (2km). Do explore the Eure Department, your holiday home base, it has so much to offer! People come from far and wide to visit the museum and the gardens of the famed impressionist painter Claude Monet in Giverny (17 km), the best known tourist attraction in this area! Other day trips can be made to one of the most beautiful villages of France, Lyons-La-Forêt (36 km), located as its name suggest, in the middle of a forest. At the banks of the River Seine there is the imposing castle of La Roche-Guyon (14 km).